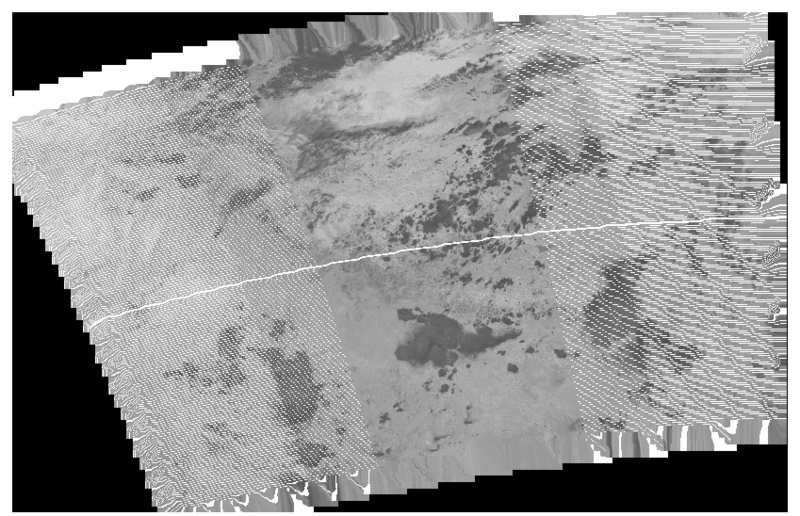 I am working on VIIRS SDR dataset. I had different layer of Brightness temperature, latitude and longitude in given .HDF5 dataset. Using reference from http://geoinformaticstutorial.blogspot.in/2014/06/reading-and-map-projecting-amsr-2-data.html I had created different VRT files and warped it to give geolocation. I got raster of Brightness temperature as shown in uploaded image below. it is in .tif format. I am also attaching VRT files which I had created. https://drive.google.com/open?id=1t3gFJYl0SdysS2zEJxlRJsU0kD0CR0_J (Bright.vrt) , https://drive.google.com/open?id=1hbCyWGjqw4VwIJjk9d_bQKW1ElJ5ibxb (lat.vrt) and https://drive.google.com/open?id=1ni27bXVnQ0ejyHMmF47Hebba-FOFTP3x(lon.vrt) According to user guide of the dataset, lines appearing in the image should be removed after giving geolocation. Kindly help me to figure out what can be wrong with it? Browse other questions tagged gdal gdalwarp geolocation vrt or ask your own question. Fixing raster with wrong Eastings using QGIS and GDAL?